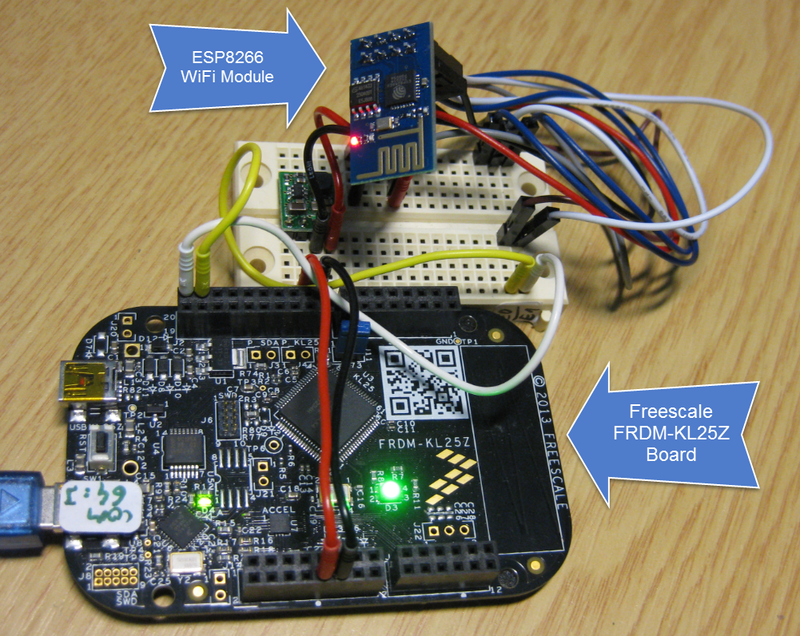 In this tutorial I’m using a Freescale FRDM-KL25Z board as a web server, using theESP8266 board. 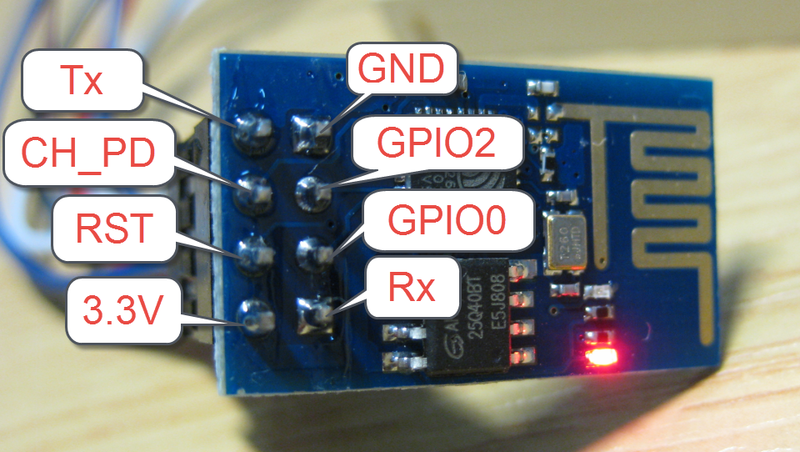 The ESP8266 is a ‘less than $4.5′ WiFi board getting more and more popular as an IoT board. 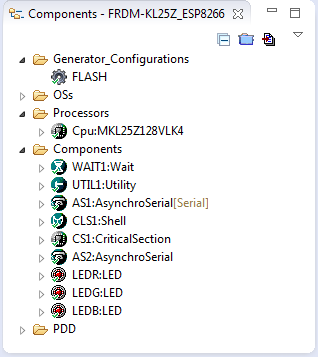 There is even a way to run the ESP8266 standalone (because it has a full processor on that board). However, that development is still in the flux and rather unstable. Instead, I’m using a serial connection to the ESP8266 instead. With this, any small microcontroller can send and receive data from the internet: connect that board to a microcontroller with 3.3V, GND, Tx and Rx, and you have a W-LAN connection! 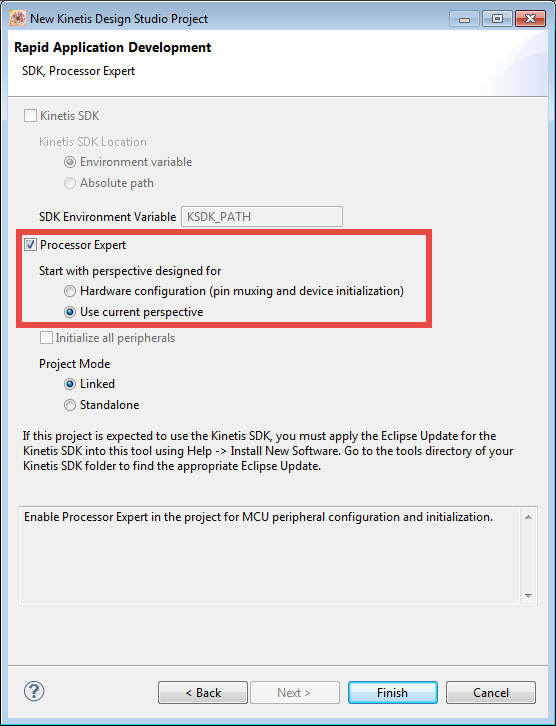 I’m using in this tutorial Eclipse with GNU/GDB with Processor Expert, but with the steps in this tutorial you should be able to use any other toolchain too. As things might change in the future with different firmware on the ESP8266: the firmware I’m having on the board is version 00160901. Because the ESP8266 can take > 200 mA, I’m using a 5-to-3.3V DC-DC converter. I measured around 70 to 90 mA, so it is not (yet) really needed, but I wanted to use it to protect to board. 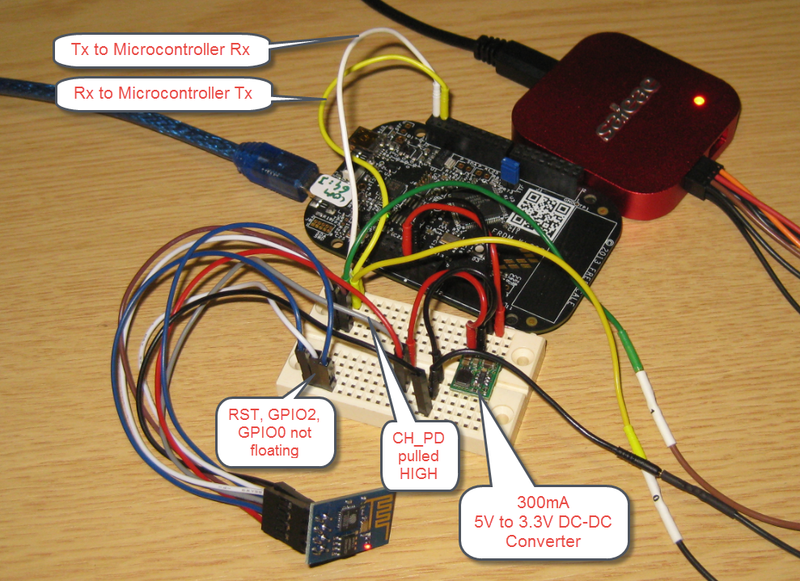 The ESP8266 Rx and Tx are connected to the microcontroller Tx and Rx pins. A general frustration point for the ESP8266 module is the connection oft the remaining pins. What worked for me is to connect CH_PD to 3.3V and leaving RST,GPIO0 and GPIO2 unconnected/floating. 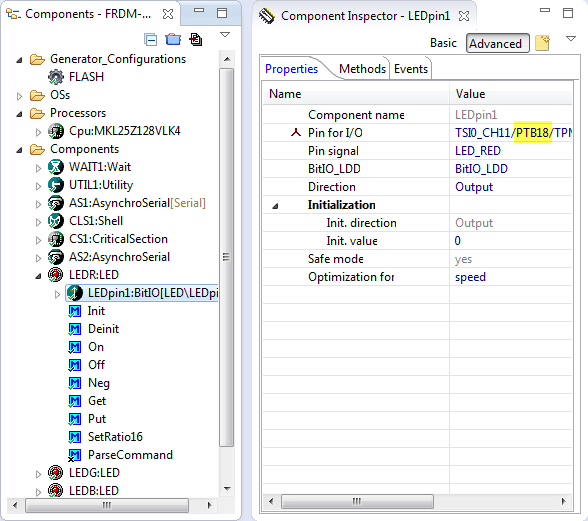 I recommend to use a logic analyzer to verify the communication between the ESP8266 and the microcontroller. 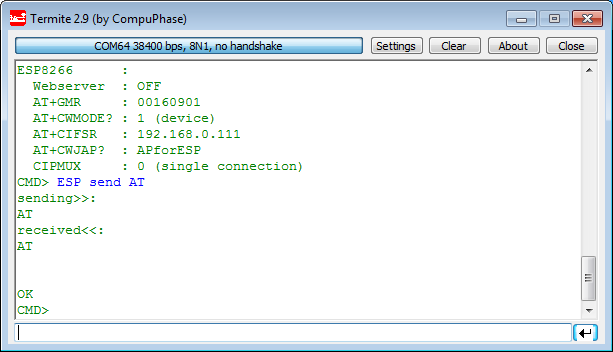 My module communicates with 115200, but I see reports that other modules (other firmware) can use a different baud. 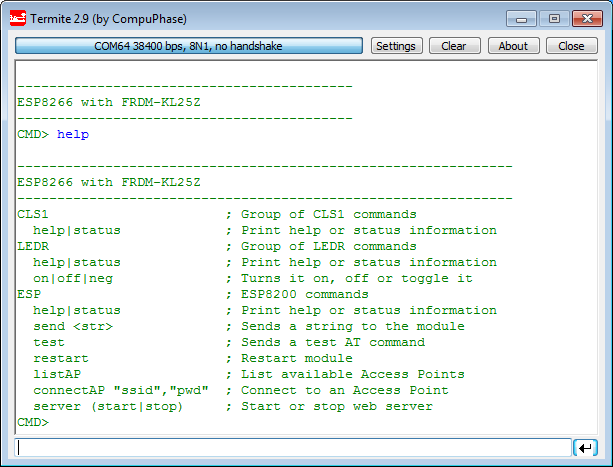 In this tutorial I’m using a command line shell (see “A Shell for the Freedom KL25Z Board“) to have a manual mode to send commands to the module. More about this later. You can use my project and source files available on GitHub (see link at the end of this article). Or create your own project. 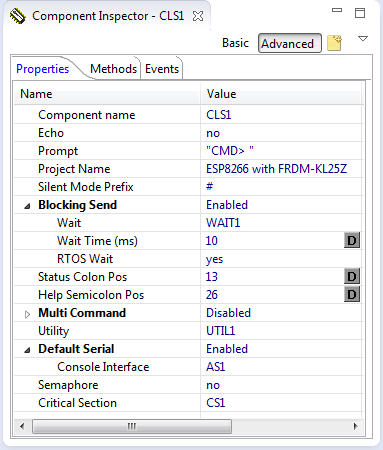 My project is using the Kinetis Design Studio and for the FRDM-KL25Z board (MKL25Z128VLK4). 084. * \brief Join an access point. 116. * \brief Used to determine if the web server is running or not. 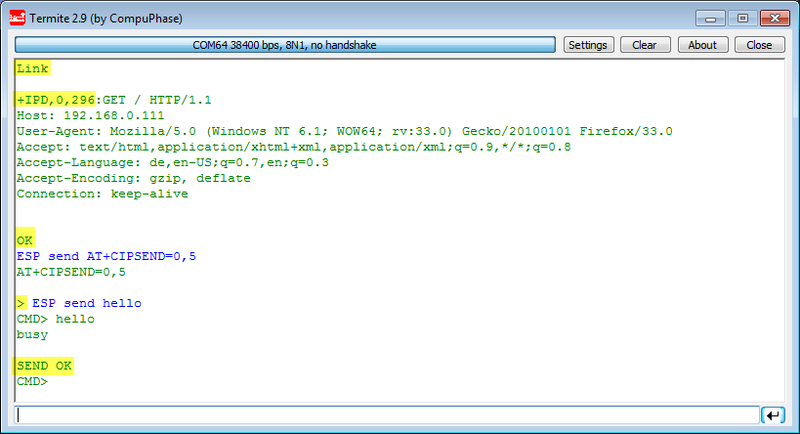 The main loop of the application is Application.c, along with the application specific web server code. 10. ** This module contains user's application code. 21. ** This module contains user's application code. 88. ** for the Freescale Kinetis series of microcontrollers. 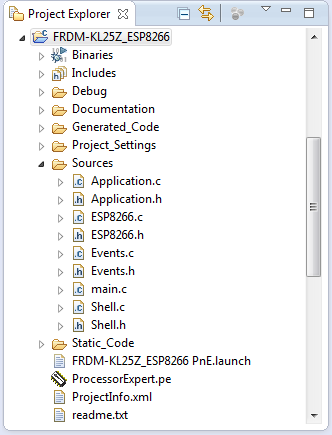 In addition, I’m using several Processor Expert component which are available fromSourceForge. Wait: Busy waiting component, e.g. to wait for a few milliseconds. Utility: string manipulation and utility functions. The LED components are configured for the pins used on the board: PTB18 for red, PTB19 for green and PTD1 for blue LED. Note that for every command a trailing “\r\n” will be sent. So instead of using the programmatic way, the shell can be used to ‘manually’ drive a web server, at least most of the part. So I’m using command line commands below to explore how the ESP8266 module works. With the project (link to GitHub below), I have a serial connection and command line shell interface to the module. Compile the project and download it to the FRDM-KL25Z board and use a terminal program (I use Termite) to talk with the module. With this, I’m ready to send commands to the module :-). 3: ‘both’. Not really clear to me, but it seems that in this mode the device is in a hybrid mode? :! : I experienced problems with that command in an environment with lots of access points visible. In this case it seems the module hands up. Try first in a place with only a few access points. 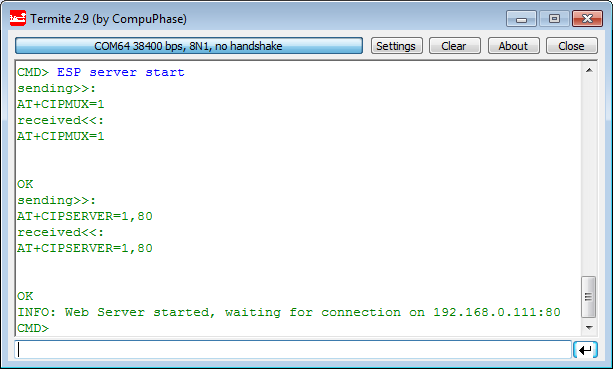 For this tutorial I have configured an access point with SSID “APforESP” which shows up in my list. <ssid>: the SSID (string) of the access point. Of course replace and with your setup. The module should report back an “OK” message, and you are connected :-). :! : The module stores the ssid and password. After power-up, the module will automatically reconnect to the Access Point. 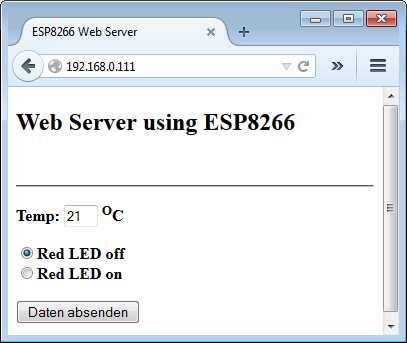 Now as we hav a connection, it is time to use it to run a web server :-).What I want to serve a web page which I can use to turn on or off the LEDs on the board. The parameter is either 0 (single connection), or 1 (multiple connections). For a web server I need to set it up for multiple connections. :info: To make it clear, I have included the ‘\r’ and ‘\n’ in the responses. The first parameter is either 0 (close connection) or 1 (open connection), followed by the port. I use here the standard http port (80). No I have a connection open on my IP address (see above: 192.168.0.111), listening to the port I have specified (80). For clarity I have specified the standard HTTP port (80). So if you are using a different port, make sure you specify it in the address line. The ‘Link’ indicates that it has established a link. IPD (IP Data?) is followed by the channel number (this will the one we have to respond to), plus the size of the following data (296 bytes in that case). and now the browser shows the content right away :-). So far I have used the module in command line and manual mode. This is great for exploration of the protocol, but for building the web server I need to do this programmatically. For this I run my ‘main’ loop in APP_Run(). After printing a greeting message and initializing the sub modules, it processes the web/module responses, parses the shell command line interfaces and blinks the green (LEDG) LED. With this, I handle GET and POST messages and can toggle the LED on my board :-) :-). It is amazing what is possible with this tiny and inexpensive ($4.50) WiFi module. The simple AT interface allows small and tiny microprocesors to connect to the internet or the local network. With all the hype around ‘Internet of Things’ this is where things very likely will end up: small nodes connecting in an easy way to the network. The processor on that ESP8266 is probably more powerful than the KL25Z (the specs and data sheets of that ESP8266 are still evolving). Or it is possible to run that module in standalone mode too which is a very interesting approach too, see the links at the end of this article. But still having an UART way to connect to the network is very useful and powerful. Other modules costs multiple times more. I expect that many vendors will come up with similar integrated modules e.g. 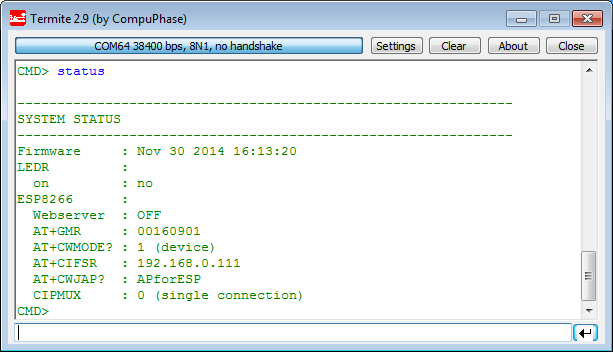 to combine an ARM processor with the WiFi radio, similar that ESP8266 module. For sure that ESP8266 has a head start and paved the way how WiFi connectivity should work. We all will see what the future brings. Until then, that ESP8266 module is something I can use in many projects :-).